The search for element 119 will begin in December 2017, researchers have announced. Riken director Hideto En’yo made the announcement at the SHE 2017 conference in Poland, and predicted that both elements 119 and 120 will be discovered within five years. Elements beyond plutonium do not exist naturally on Earth and have to be synthesised in a laboratory. For the heaviest elements, this is done by firing a beam of ions at a heavy element target, in the hope that the nuclei will fuse together to form a new, heavier nucleus. Such events are rare, however, because even when a collision occurs it must happen at just the right energy: too low, and the nuclei bounce off each other; too high, and the new atom bursts apart. The long duration of these experiments, in which single atoms lasting seconds are produced sometimes years apart, and their prohibitive costs mean only a handful of laboratories in the world are capable of running them. In 2016, the Riken team, led by Kosuke Morita, was recognised by the International Union of Pure and Applied Chemistry as the first to make element 113, nihonium, by bombarding bismuth with zinc ions. To reach 119, however, the team will bombard a curium target with a vanadium ion beam. 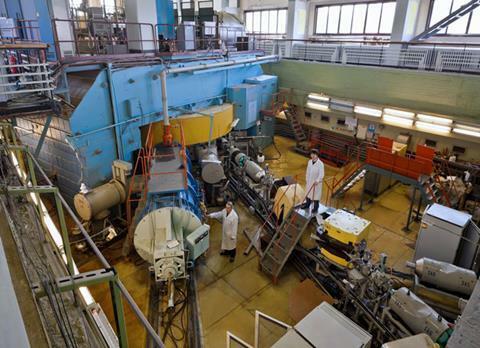 The target has been supplied by Oak Ridge National Laboratory (ORNL) in Tennessee, US, which previously collaborated as part of a US—Russian team under Yuri Oganessian to discover element 117, tennessine. For the 119 experiment, En’yo says two beam lines will run concurrently – Riken will start with a cyclotron beam while upgrading its linear accelerator, before continuing the search with both machines. ‘[They] will then run in parallel until the discovery is made,’ En’yo confirmed. 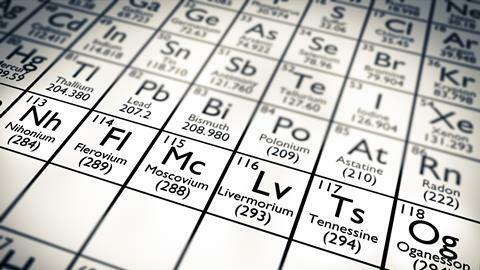 Explainer: How do you make an element?